You already know that AMT Datasouth’s printers featuring the PAL proprietary programming language interpret virtually any data stream in any hospital, but now with the PALSECURE ON DEMAND solution healthcare employees can print secure data on labels and wristbands anywhere in the hospital, even without a network connection. With a PALSECURE ON DEMAND printer a master 2D barcode label can be made upon patient check-in. 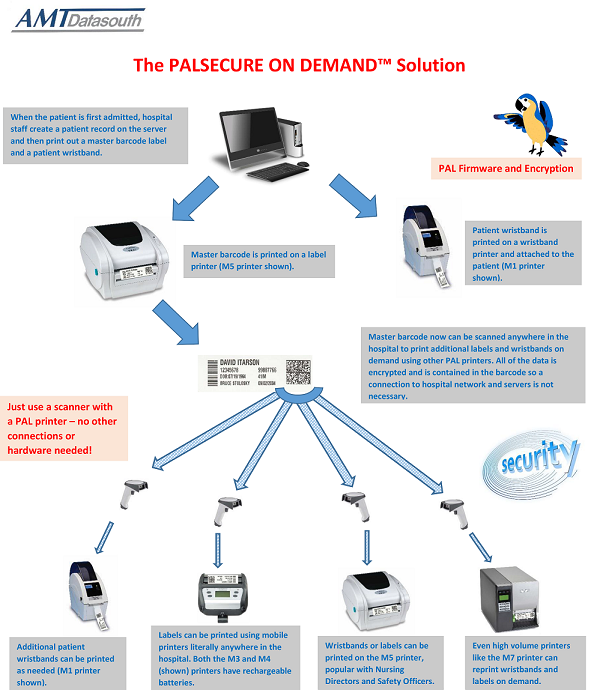 The PALSECURE ON DEMAND solution automatically encrypts the patient data when it gets bar-coded to ensure the data remains safe and human unreadable, even by a barcode scanner. But when the scanned image is fed to another PALSECURE ON DEMAND printer anywhere in the hospital – no network connection necessary—a decrypted, approved proper label is produced. 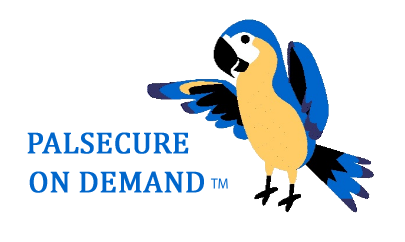 The PALSECURE ON DEMAND solution eliminates the vulnerability of exposing patient private information that now exists with on demand label solutions. No longer will a master 2D barcode or other patient wristbands and labels reveal private patient information when looked at with a scanner, smartphone or tablet. With data breaches making so many headlines these days, coupled with the many patient privacy concerns, the PALSECURE ON DEMAND solution is sure to be a welcome addition to the hospital’s privacy protection program. In addition to security, PALSECURE ON DEMAND labels save money, time, and makes things easier for busy hospital staff. Using traditional methods, healthcare professionals have to use costly sheets of labels – hopefully shredding what they waste – when they only need one or two labels at a time. With the better standard thermal printer approach, a static workstation is needed to produce the copies, taking hospital staff regularly away from the patient’s side, while leaving the label security issue unresolved. Now imagine how much simpler and easier the PALSECURE ON DEMAND solution is; they just print what is needed (on demand) wherever they are in the hospital right at a patient’s side, nurse’s station, or wireless cart – with just a printer, scanner and a data Secure master. This provides economics and security to an otherwise chaotic and risky process. The PALSECURE ON DEMAND solution is available for all AMT Datasouth Fastmark Thermal Printers: from the small M1 wristband printer and our mobile M3, M4, and PT-1 printers to the versatile M5 desktop and even our high-powered M6 Plus, M7, and M8 printers – providing so many solutions for your customers. The PALSECURE ON DEMAND solution– secure, cost effective, and makes the healthcare professional’s job easier and allows them to focus more on job one – the patient.